When I began to write down all that Mom meant to me I realized I could go on and on, but I have decided to keep it "Short and Sweet".. just like her. She sure fought hard and never wanted her illnesses to hold her back. How she managed to accomplish all she did is a true testament to her strength and spirit. Although I am no Artist, if I could paint a picture with words to describe her they would be: Loving, caring, confident, beautiful, positive, realistic yet creative and open minded..always ready for a new adventure. She loved learning and in turn shared her knowledge by teaching others. She meant so much to many and I am sure we can all agree that she was a very special Daughter, Sister, Sister in Law, Wife, Mother, Mother in Law, Friend, Aunt and Grandmother. Family was so important to my Mom, and she came from a great one that is filled with love from her three Sisters and two Brothers. Their special group of six has now become five and I know they are missing her. As far as our immediate family goes...her role as a Wife, well she believed in love and commitment and was proud to share nearly forty four years of marriage with my Father. Together they have built memories that my Dad will cherish in the days to come. As a Mother, she did her very best to bring us up right..and ya I think we turned out pretty good. She couldn't be happier that we have found success in our careers and even more important have found love and life mates. Jason and Mike meant so much to her and they will both agree the feeling was mutual. With our happy marriages came her hope for Grandchildren..and for the longest time she had to be satisfied with the four legged furry type. Don't get me wrong, she loved all our special dogs and recently found her own special one "Cuddles". But just this past September while celebrating her 43rd Wedding Anniversary, Shelly and Mike told her she could look forward to a Grandchild in the New Year..and this past May when Jacklyn was born my Mom was the first person in our family to hold her and she was beaming with joy! I know Shelly and Mike are struggling now because they feel Mom only got to spend such a short time with Jacky, but I feel that they shouldn't worry because she will be watching from Heaven..every step of her life, she has a reserved front row seat. As for her Friends.. one of her many, many friends told Shelly and I " There was no such thing as a casual friend for Linda" so please know that each and every one of you were dear to her. She lived for surrounding herself with others and always enjoyed parties gatherings and celebrations. Our Mom is sadly missed by manyiincluding her sweet little dog “Cuddles”. She will be missed for her wonderful gift of creativity that she shared with the world. Her talent could be seen through her artwork, crafts and gardening. 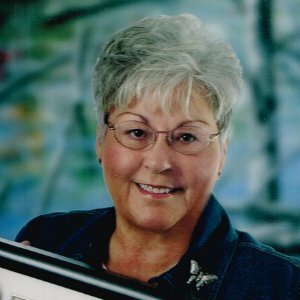 She was a proud member of the Walden Art Club and also enjoyed teaching art to her family and friends.Her giving nature led her to be a member of the Waters Women’s Institute and she truly believed in their mission of helping others. The light of her life was her family and friends whom she loved so dearly and she was so blessed with the newest family member her only granddaughter Jacklyn. Mom we miss you more than words can express. You will always be in our hearts and thoughts and your legacy will live on in Jacklyn because we will tell her all about you!